Yoder Lumber, a third-generation family business, used Lucidchart to implement Six Sigma and deliver products faster to meet customer needs. Yoder Lumber decided to use Lean Six Sigma principles to deliver high-quality products faster. 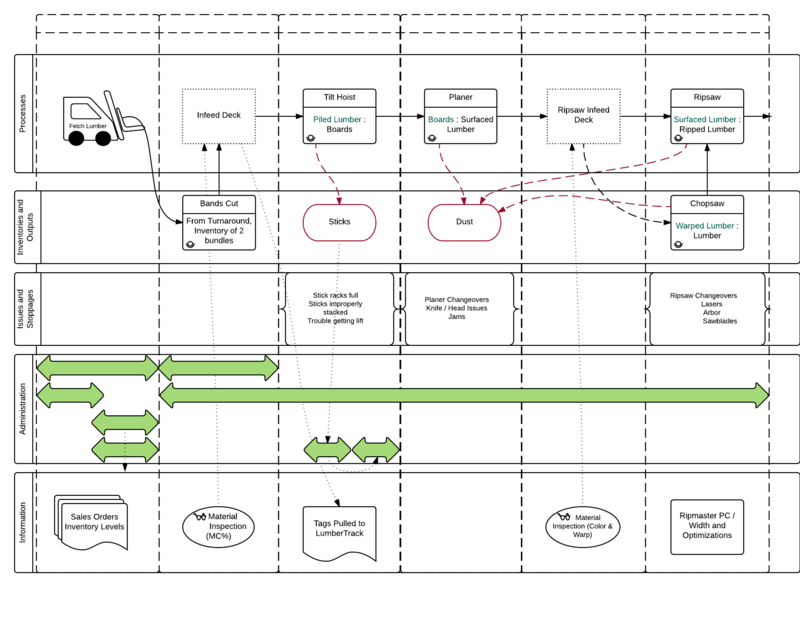 They created process flow diagrams in Lucidchart to understand the current manufacturing process. As leadership worked together to reduce waste, they could highlight areas for improvement or make changes to the process flow diagram on the spot as people gave feedback. Once leadership made changes to the process, they shared the process flow diagrams with employees to add credibility to their findings and make sure employees understood what was expected of them. 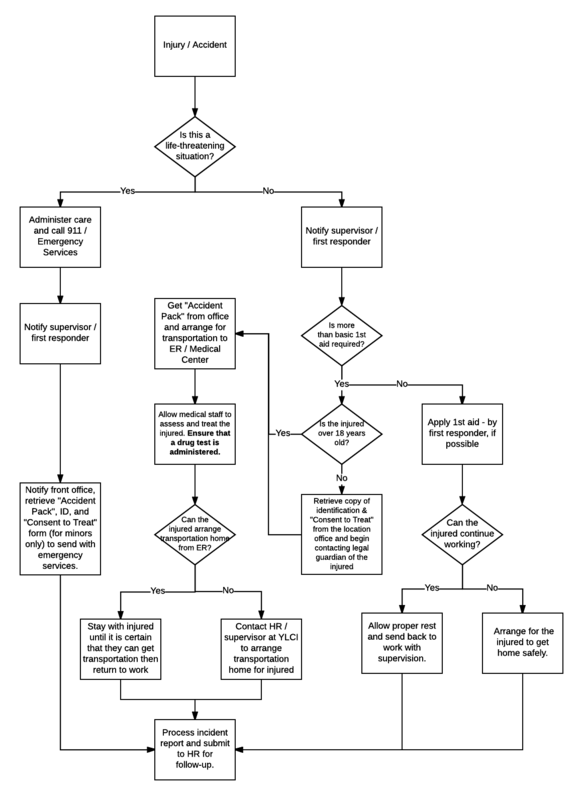 Yoder Lumber has also used Lucidchart to create decision trees (that they then print out and store in the safety handbook) that show employees how to respond to accidents in the workplace. Over 70+ years, family-owned Yoder Lumber has grown from a five-person team with a portable sawmill into a corporation that manufactures and distributes Appalachian hardwood products in three different locations. When it comes to the quality and speed that customers demand from manufacturers, retailers, and other businesses, the last 10 years have been revolutionary. Think about it—if you wanted to order a new toaster for your home, you can look through hundreds of options on Amazon until you find the model with every feature you need (stainless-steel surface, slots that fit bagels, etc.) in your preferred price range, and you can receive your order a mere two days later. But these customer expectations don’t apply to just minor purchases on Amazon. They are impacting the manufacturing industry as well. Whether the order is big or small, manufacturers everywhere face a whole new set of standards as they strive to meet customer needs. A lot of Yoder Lumber clients use the just-in-time methodology, where companies aim to increase efficiency and lower inventory costs by receiving goods only as they need them within the production process. So not only do Tony and his team need to provide items that match a client’s specifications, but they need to deliver them quickly. Where Yoder Lumber used to have a two- to three-week lead time, they now only have a few days in some cases to deliver the requested products. How can you effectively meet customer needs—both in speed and quality? Application: Lean manufacturing can seem like a lofty vision at first, and the reality of implementing it will means different changes for different companies. How would Yoder Lumber actually apply this methodology in their workflows? Training and implementation: Even once they nailed down an updated process, Yoder Lumber knew they would need to explain these changes to employees who may not understand these abstract ideas or buy into the new process quickly. Spoiler alert: These challenges weren’t challenges for long once Yoder Lumber turned to Lucidchart. Our visual productivity platform has helped this third-generation family business visualize processes to ultimately deliver the high-quality goods they have promised customers. For Tony Yoder, what enables someone to succeed in an operations role is “knowing the process that it takes to produce the product comprehensively.” This qualification becomes essential in Lean Six Sigma—you have to know the strengths and failings of the current process to make strategic changes. Both Tony and Ryan expressed that diagramming processes is a group effort, and Lucidchart’s features make it easy for teams to collaborate. Tony and Ryan pull up the process flow on a projector or laptop and make changes on the spot as team members give feedback—changes that are automatically saved to the living diagram everyone references. If you remember, there’s another significant challenge when switching to Lean Six Sigma: training and implementation. Yoder Lumber found places where they could streamline the manufacturing process, but then they had to make these complex processes accessible for employees performing the work, especially in a community that’s not as technology-focused. Lean Six Sigma doesn’t go anywhere if employees don’t adapt. When employees understand the process the first time around, they can start cutting waste and production times right away. Tony and Ryan mentioned that, in particular, automatic alignment and the extensive template library available in Lucidchart have made it easy to present something professional without much effort or training. And the benefits of Lucidchart don’t stop there. Aside from Lean Six Sigma processes, Tony Yoder has used Lucidchart with his safety coordinator to build out documentation for how to respond to accidents in the workplace. Most productivity apps save companies money, but what if one can save lives—or at least make sure the injured employee gets to the doctor safely? With Lucidchart, Yoder Lumber visualizes various parts of the manufacturing process to make work better for employees and guarantee high-quality products for consumers. Whether you’re part of a growing, family-owned business or a corporation that spans the globe, whether you strictly adhere to Lean Six Sigma or prefer your own methods, our platform has a solution for you. Analyze and optimize manufacturing processes. Try Lucidchart!